Pal-Con, Ltd. has the full turn-key solution to keep you in compliance with RICE NESHAP. With the recent passing of the US EPA rule for reciprocating internal combustion engines to meet the national emission standards for hazardous air pollutants (also called the RICE NESHAP rule), many existing in-service engines will require retrofitting with catalytic emission control. 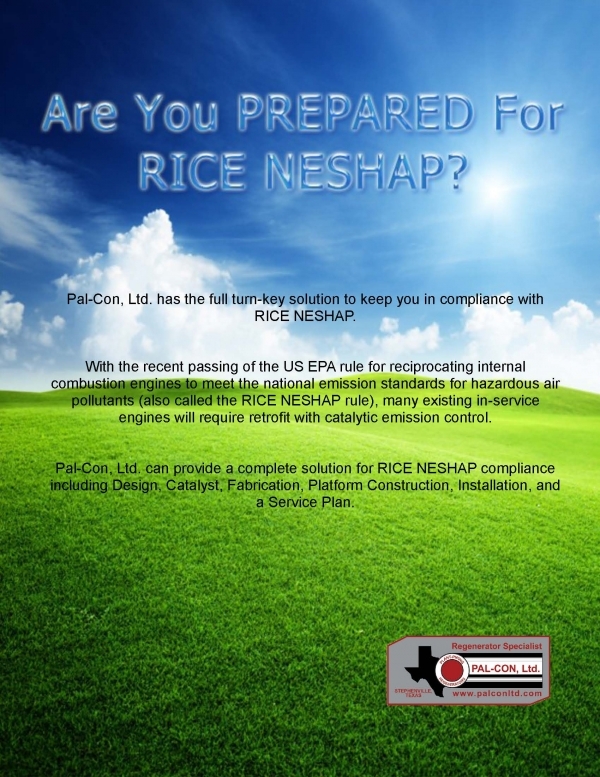 Pal-Con, Ltd. can provide a complete solution for RICE NESHAP compliance including Design, Catalyst, Fabrication, Platform Construction, Installation, and a Service Plan.